When you see beautiful orchids with ovate-flattened, stretched pseudobulbs, bright, and showy (and often fragrant) flowers, born in inflorescences, most likely this is Cambria orchid. 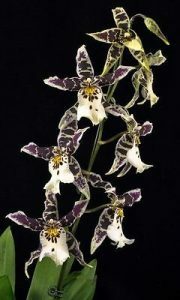 It sounds strange, but this is not a real name for these marvelous orchids. In fact, Cambria is a synonym for a bunch of quite different names of the Oncidinae group complex hybrids. Cambria orchids vary greatly in their exteriors – some have more elongated leaves and bulbs, some tend to be more round. 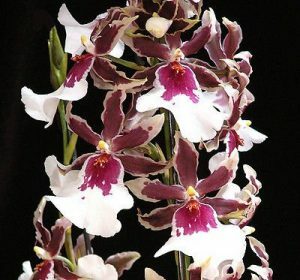 Sizes also vary significantly, as well as flower sizes and colors, but in general, they have a large lip, which gives them characteristic “dancing doll” look, similar for the most Oncidium alliance orchids. 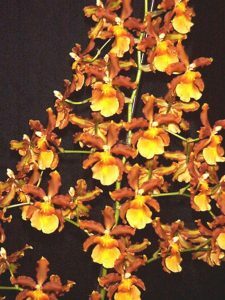 They are also quite often very fragrant – especially hybrids of certain Oncidium species. They have incredible aromas of vanilla, chocolate, bakeries and French perfumes. 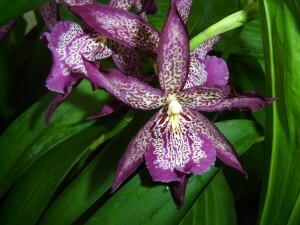 The first hybrid between Odontoglossum crispum, some Miltonia and Cochlioda noetzliana was created by Charles Vuylsteke in 1910. 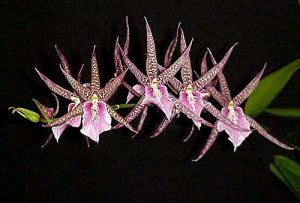 This hybrid genus was called Vuylstekeara, which later via hybridization with Odontoglossum clonius produced famous Vuylstekeara Cambria Plush. 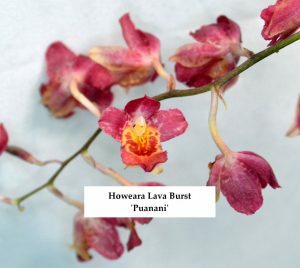 Later orchid breeders produced numerous Oncidium Alliance complex intergeneric hybrids, including Aliceara, Bakerara, Beallara, Brassidium, Burrageara, Colmanara, Degarmoara, Howeara, Maclellanara, Miltassia, Odontobrassia, Odontocidium, Odontonia, Rodricidium, Trichocidium, Vuylstekeara, Wilsonara and Miltonidium. 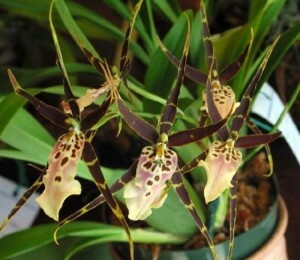 They are numerous and all beautiful, but it is quite confusing, especially if you are an orchid vendor. 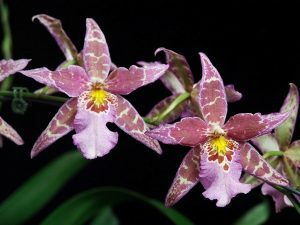 Some of this names give us some glimpse on a hybrid genealogy (for instance, Miltassia is a hybrid between Miltonia and Brassia orchids), but some have very difficult pronunciation (for instance, how do you pronounce Vuylstekeara?). 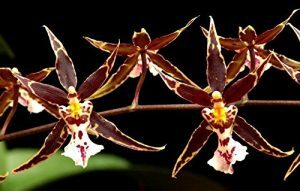 Given the fact that there are no any visible differences in their culture and for marketology reasons they are all were given the umbrella term “Cambria”, which is now a synonym for complex Oncidium Alliance hybrid. 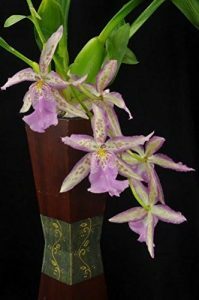 Cambria orchids care is quite simple, it is much easier to grow Cambria orchids indoors than most species of Ocidinae in their genealogy, especially cool and cold Odontoglossum and Miltonidium species. They require moderately bright light with some sun in the first part of a day. Potting mixture should contain medium bark with some sphagnum moss, cocoa chips and should be well drying and open. Let potting mixture to become slightly dry between watering, do not overwater it because roots will rot. Cambria orchids do not have definite dormancy and usually after flowering have some dormancy for three or four weeks before new growth starts forming, so after flowering you have to slightly reduce watering and do not apply fertilizers. Temperatures should be intermediate, but most of Cambria orchids tolerate warm and even hot temperatures, which is the difference between Cambria hybrids and some Odontoglossum species, which do not tolerate warm temperatures for long periods of time.